The name speaks for itself: with the best bloodlines from all over Europe (France, Hannover, Holstein, Netherlands, Oldenburger, Westphalian) this stallion forms a promising upcoming dressage talent. 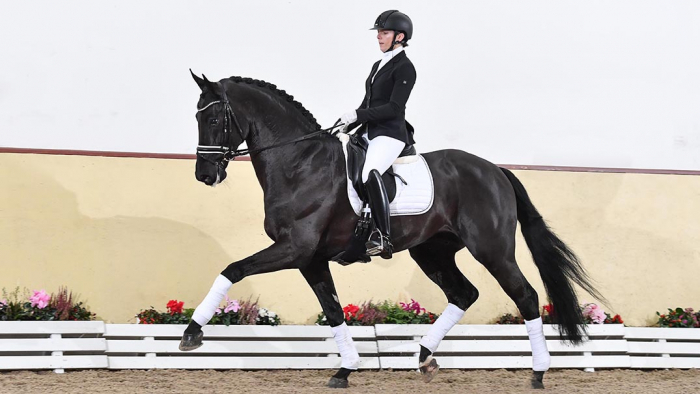 He was awarded premium stallion at the Hanoverian stallion licensing in 2018 and was in high demand at the following auction. His sporty quality meets all requirements for a good riding horse: Lord Europe has strong nerves and the best gaits, which have been presented energetically and powerfully. Additionally his continuous self-carriage and balance have been very convincing. The sire, Lord Leatherdale, had victories up to S-level in dressage and has in strong frequencies 15 licensed sons in the Netherlands. The popular grand sire, Boston, comes from the Netherlands, but unfortunately only showed a short presence in German breeding. He was successful in dressage tests for young horses but unfortunately died at an early age of only six years. Nevertheless, he managed to have nine licensed sons, one of them being Borsalino, the winner of the stallion licensing in Westphalia 2014 and further well-known sons being Bailando, Bernay, Bombastic and Bossanova. Lancer II, in third generation, was the champion stallion of the Holsteiner licensing in Neumünster and one of the most successful sons of the Holsteiner stallion of the century, Landgraf I.
Lord Europe is licensed in DWB, OLD, HANN, WESTPH, Süddt. Verbände, Mecklenburg, Rheinland. Lord Europe is stationed at Helgstrand Dressage.